Graphite – Applications of Graphite, Major Producers of Graphite. Diamonds – Diamonds in India, World. Differences between Diamond and Graphite. Graphite is a naturally-occurring form of crystalline carbon. It is also known as plumbago or black lead. The carbon content in Graphite is never less than 95%. Graphite may be considered the highest grade of coal, just above anthracite. It is not normally used as fuel because it is difficult to ignite. It is found in metamorphic and igneous rocks. Graphite is extremely soft, cleaves [splits into layers] with very light pressure. It is extremely resistant to heat and is highly unreactive. Most of the graphite is formed at convergent plate boundaries where organic-rich shales and limestones were subjected to metamorphism due to heat and pressure. Metamorphism produces marble, schist and gneiss that contains tiny crystals and flakes of graphite. Some graphite forms from the metamorphism of coal seams. This graphite is known as “amorphous graphite”. Graphite is a non-metal and it is the only non-metal that can conduct electricity. Natural graphite is mostly consumed for refractories, batteries, steelmaking, expanded graphite, lubricants etc. The lithium-ion battery utilizes roughly twice the amount of graphite than lithium carbonate. Natural amorphous graphite are used in brake linings for heavier vehicles, and became important with the need to substitute for asbestos. Graphite lubricants are specialty items for use at very high or very low temperatures. Modern pencil lead is most commonly a mix of powdered graphite and clay. India is a major global producer of flake graphite. Graphite is not mined in the United States. U.S. substitutes graphite with synthetic graphite. Diamonds are formed in mantle. They brought to the earth’s crust due to volcanism. Most of the diamonds occur in dykes, sill etc. [Volcanic Landforms]. Diamond is the Diamonds are used in ornaments, polishing the surfaces of metals and in gem cutting. The most important industrial use of diamonds is in cutting-edges of drills used for exploration and mining of minerals [Diamond is the hardest substance and it can break other substances without itself getting broken]. The Vindhayan system have diamond bearing regions from which Panna and Golconda diamonds have been mined. 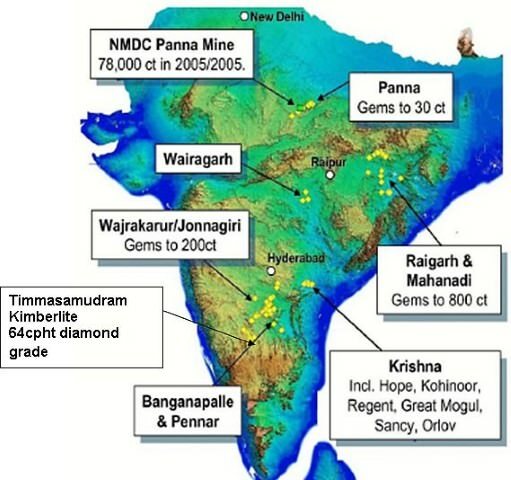 Gravels of the Krishna river basin in Andhra Pradesh. Reserves have been estimated only in Panna belt and Krishna Gravels in Andhra Pradesh. The new kimberlite fields are discovered recently in Raichur-Gulbarga districts of Karnataka. Reserves of diamonds in India are not yet exhausted and modern methods are being applied for intensive prospecting and mining. Cutting and polishing of diamonds is done by modem techniques at important centres like Surat, Navasari, Ahmedabad, Palampur etc. The leading producers of natural diamond are Russia, Botswana, Canada, Australia, South Africa, Russia and Zaire [Congo]. Other important producers include Namibia, Ivory Coast, Sierra Leone, Venezuela, Brazil etc. Russia holds what is believed to be the world’s largest and richest diamond resources. Botswana is the leading diamond-producing country in terms of value, and the second largest in terms of volume. The two important ones are Orapa and Jwaneng, two of the most prolific diamond mines in the world. Botswana’s resources produce the full range of diamonds, in all sizes, colors and clarities. Democratic Republic of Congo (DRC) is also one of the Africa’s largest diamond producer. Australia is the leading producer of color diamonds. Australia is famous for its pink, purple and red diamonds. South Africa has the most diverse range of diamond deposits in the world. Deposits include open pit and underground kimberlite pipe/dyke/fissure mining. The carat (ct) is a unit of mass equal to 200 mg and is used for measuring gemstones and pearls. Graphite and Diamond are the major allotropes of carbon. Other important allotrope being anthracite coal. Graphite and diamond share the same composition but have very different structures. Graphite contains 95% or more carbon. Diamond is 100% carbon. Graphite is a non-metallic mineral that forms when carbon is subjected to extreme heat and pressure in Earth’s crust and in the upper mantle. Diamond is also a non-metallic mineral that forms when carbon is subjected to extreme heat and pressure in the mantle. Graphite is one of the most stable substances on earth. Diamond (one of the most stable) is less stable than graphite. The carbon atoms in graphite are linked in a hexagonal network that forms sheets that are one atom thick. These sheets are poorly connected and easily cleave or slide over one another if subjected to a small amount of force. This gives graphite it’s very low hardness, its perfect cleavage and its slippery feel. [Pencil Lead is not made of lead as we normally beleive. It is made of graphite. You know why?] In contrast, the carbon atoms in diamond are linked into a frameworks structure. Every carbon atom is linked into a three dimensional network with strong covalent bonds. This arrangement holds the atoms firmly in place and make diamond an exceptionally hard material.